If I could tell you only one thing about the Eugene Marathon, it would be this: Go run it! Of course, if you know me, you know that I have far more than just one thing to say on the subject. 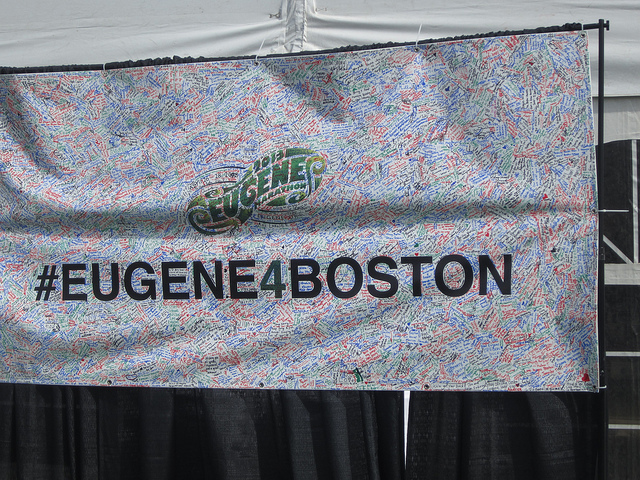 Eugene first caught my eye last year when Charlie and I were scoping races for a spring marathon to run together. 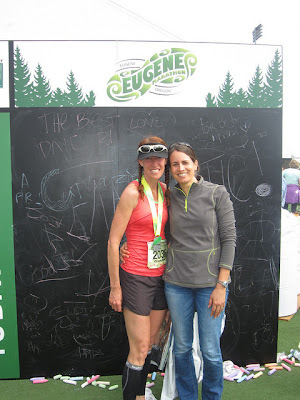 We figured Eugene would be a great place to run fast, and Big Sur would be perfect if we just wanted to relax and stick together for the whole race. Obviously, Big Sur was the right call, but after looking so closely at Eugene, I knew it was one that I wanted to run one day. Turns out, I only had the patience to wait one year. My training has been what you might call bipolar. With an overloaded work schedule and a frequent lack of motivation, my main goal has been to enjoy my running. 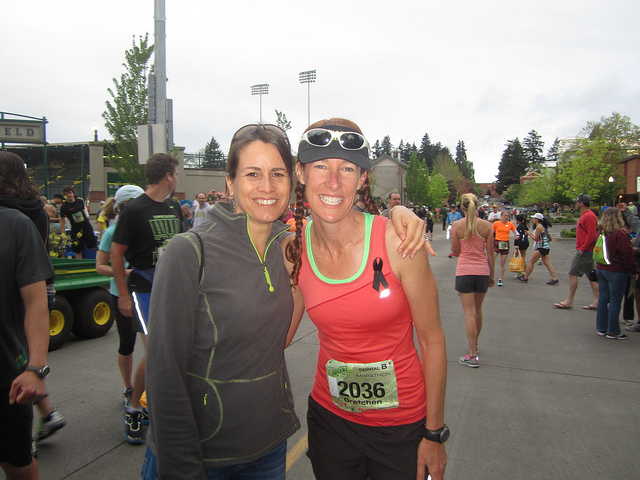 I didn’t do any of the long, goal-pace road runs necessary to run a truly fast marathon. It just didn’t sound like fun. Instead, I spent weekends in the canyons with Jamie. What my long runs lacked in speed, they more than made up for in enjoyment. My weekly mileage for March and April averaged somewhere around 40. Not bad for marathon training, if not exactly spectacular. 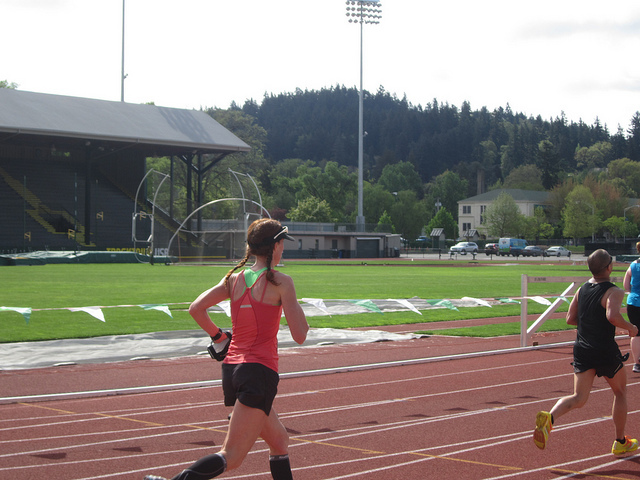 The only thing I did do to help myself was put in some solid track workouts. I’m not afraid of a vicious set of intervals, although it’s true that my favorite part of any speed session is that slow, satisfying, barefoot jog around the soccer fields after it’s all over. I spent Tuesday evenings at the Reno High track and ran, among other workouts, a bunch of those damn Yasso 800s. Such a love-hate thing, interval workouts. Marathon day approached, and I’d managed to average 3:01 for 8X800 during track workouts, but only 7:50 pace for a “long” road run of 16 miles. What did this mean for a potential finish time? No clue. I was more than a little shaken by what happened at Boston, and I just couldn’t get myself out the door for any final training days. Sickened and confused by the bombing of an event I love, motivation abandoned me. It resulted in a significantly longer taper than I would normally give to a marathon leading into a season of ultras, but whatever. I truly didn’t care. I knew the one thing that might lift my spirits though. Running a marathon. I was also extremely lucky that Charlie had agreed to join me for the weekend, even though she wouldn’t be running. It’s so rare that I have my own, personal cheering section! I also have little interest in travelling any real distance for a race if I'm doing it all alone. 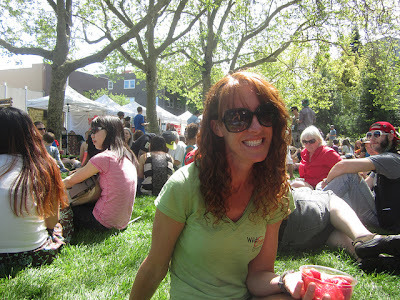 We spent Saturday hanging out at the farmer’s market in Eugene, getting a slice of the local culture. It was a perfect pre-marathon day. We sat on the grass in the warm sunshine eating tamales and watching the bluegrass kids vie for territorial rights to various street corners. I’m fairly certain U of O has some sort of entrance requirement about being able to play either the banjo or guitar, with extra credit given for fiddle or washtub base. Sunshine, organic local produce, and banjos. Yes! That night we ate Gyros and found an awesome movie theater where they serve you beer and burgers while you kick back on the couch and watch Ben Affleck get Americans out of Iran. We really need one of these theaters in Truckee! Race morning arrived with perfect temperatures. The cloud cover meant it was warm enough to start in my tank but would never get uncomfortably hot. I made my way to corral B (for 3:05 to 3:25 finishers) and bid Charlie farewell. Before the gun, we had a moment of silence for all those affected by the bombings at Boston. It may seem cliché, but this was one of the most powerful moments of the race for me. You know how things are at the beginning of a marathon: The announcer’s getting everyone excited, telling us how many minutes to the start while enormous speakers pump out Eye of the Tiger; runners are bouncing up and down in the crowd or feigning last minute stretches; a mass of well-tuned and rested bodies is ready to bolt down the open road; energy fills the air. So to have that energy so quickly silenced, sucked away as if by a vacuum, was impressive. We all stood with bowed heads, no background chatter, not even a baby crying in the distance. Silence. And somehow feeling slightly more connected to the runners around us, we headed off for our marathon adventure. I had tucked myself between the 3:05 and 3:25 pace groups in an attempt to stay out of the crowds. 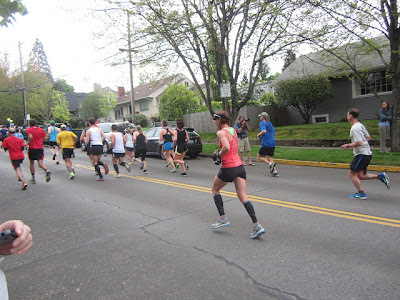 Still, the first few miles felt uncomfortably tight, and I mostly focused on navigating among the other runners and not tripping. We ran through quiet neighborhoods with adorable houses – thousands of feet stampeding through the middle of the street, while inside, people slept that beautiful sleep of Sunday mornings. Or maybe the thundering feet woke them up; I don’t know. I made a lightning-fast outhouse stop at mile four, and when I emerged, I could still see the 3:15 pace group off in the distance. I knew I really wanted to run faster than last year’s 3:19 PR at Napa, but I honestly didn’t know if I’d trained well enough for that. I felt wonderful, but of course it was still quite early. 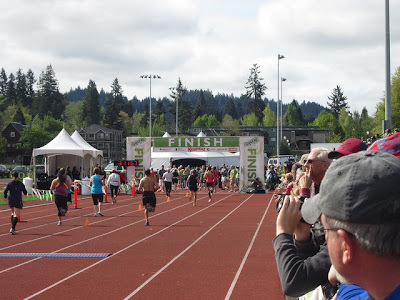 My strategy became “Don’t get ahead of the 3:15 pace group.” Sometimes I get a little annoyed at the pace groups because it’s always so crowded around them, but at Eugene, I was truly grateful for that 3:15 group. Time and again I’d be running along, just going the pace that felt good, and all of a sudden, there he’d be – that guy with the sign that said “3:15.” I’d feel the claustrophobia of the crowd and slow down to let them go ahead. My body wanted to go faster, but my brain said, “Relax. Don’t be stupid!” Generally in these situations, it’s better to listen to your brain. 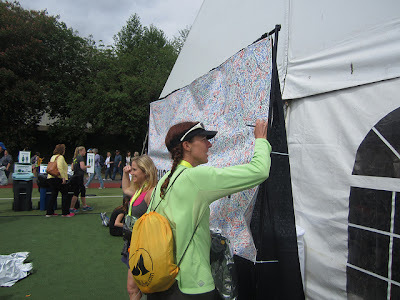 the night before, Charlie had studied the map for the best places to cheer, so I knew where to look for her: miles 1, 8, 16, and the finish. This was fortunate, since for most of the day I spotted her before she saw me, and looking forward to those brief encounters was a great way to break up the race. I entertained myself by trying to memorize all the hilarious signs people had made so that I could share them with you guys. Of course, I can only remember a few, but there were so many good ones! More than once, I saw: “Pain is temporary, posting on Facebook is forever.” Oh how true. Eventually I promised myself that if I still felt good at mile ten, I would allow myself to pass the 3:15 group. Mile ten came and went, but I was just too uncertain to pick up the pace. Same story at the half marathon. 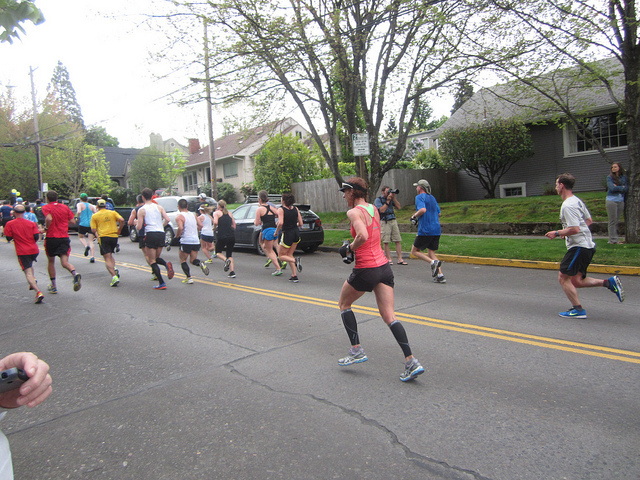 Finally, at mile 15, a parting of the crowd coincided with a short downhill. I took that as a sign and went for it. I averaged seven-flat for the next five miles, and suddenly I only had six miles to go. Mile 18. I felt completely amazing here! I found myself at the most wondrous of places: at the end of a race, on PR pace, passing other runners like mad, and feeling great. Of course, most people will tell you that mile 20 is nowhere near the end of a marathon, and they’re right. But my ultrarunner’s brain knew it was nothing, and my body told me clearly that it was not going to blow up during the course of the next six miles. My pace slipped to 7:10, and I focused on maintaining it. But here’s the thing: when you know you have a big PR in the bag, and you’re really not worried about anything, it’s kind of hard to push yourself. 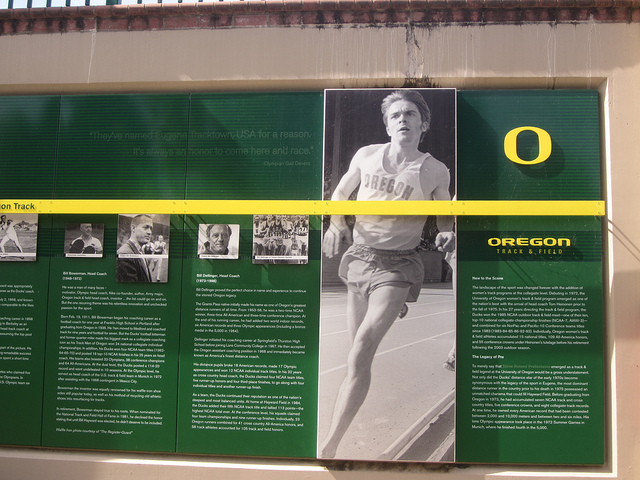 I kept thinking about how I felt during the final miles of Napa last year, and there was a stark contrast. 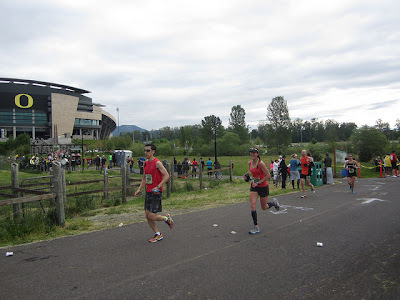 I’d been hurting at Napa, and trying desperately to hang onto a sub-3:20 finish. I’d pushed hard with everything I had. But in the final miles of Eugene, I had already exceeded all of my own expectations. I knew there was more in the tank down there somewhere, and I tried hard to go for it – to make this PR as big as possible. But I knew I felt nothing like the pain of mile 25 at Napa. I felt a little guilty for not being able to dive headfirst into the pain cave. A few twinges of guilt, however, could do nothing to derail this train of near marathon perfection. The finishline is at Hayward Field, which is so totally, completely awesome, except that you only get to be on the track for, like, ten seconds. 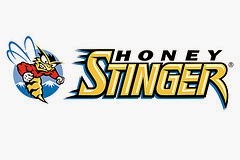 The stadium was packed with cheering fans, and people pressed up against the fences. I’m pretty sure they were all screaming my name. Next time, I will run slower for that part. I looked at the clock, and it was rapidly approaching 3:12. I thought, “Ooh, I could go under 3:12!” and sprinted for the line only to miss it by one second. Then I sheepishly realized that was the gun time. My chip time was 3:11:42. Wahoo! An eight minute PR! The finish line! You can see why I sprinted to make it under 3:12. Heh heh, silly me. Charlie and I kicked back on the soccer fields with a beer while the worst 80’s cover band ever blared in the background. Just then, the clouds lifted, and the sun shone down on my blissful face. Signing the poster for Boston. Eugene sent the poster, signed by all the participants, to Boston. I declared myself in need of a hamburger, so after showers at the hotel, Charlie Googled “best burger in Eugene.” We took a leisurely stroll along the Willamette, through green grass and sunshine and several parks, to get to a place called Cornucopia and the best burgers not only in Eugene, but probably the entire universe. I know what you’re thinking: “You started too slow!” But I really have to disagree. I always do better when I have a negative split. Maybe I could have picked up another minute with a faster first half, but I have absolutely no regrets about how this played out. 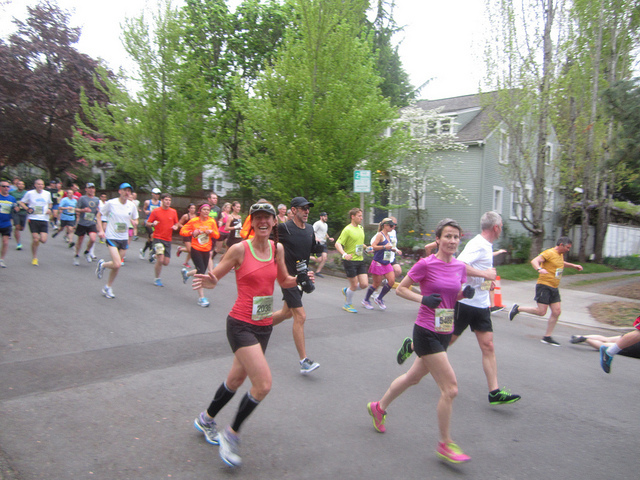 And seriously, you should go run the Eugene Marathon.